Here's another "on hand" recipe that my sister sent out to my family. She had some leftover meat from Sunday dinner and put this together with things she always keeps in her fridge. Of course, I almost never buy a few of the things on the ingredients list but they aren't foreign to me - just not what I usually pick up at the store. She does, however, so maybe some of you do too! Even if you don't have this stuff "on hand" it's worth a trip to the store. I made a couple of adjustments for my own purposes and it's a real winner. This is an incredibly easy recipe that was also incredibly delicious. David raved about it, which is saying a lot because he likes everything I make (or so he says). Combine all together in a small bowl and set aside until ready to use. In a large wok or skillet heat oil over medium-high heat. Salt and pepper the steak pieces and saute for 3 - 4 minutes. Remove meat from the pan and set aside in a bowl. Do not clean pan! Add another tablespoon of oil to the pan and saute mushrooms and cole slaw for a minute. Add meat (if using) and sauce. Cook until heated through and sauce reduces a bit (a couple of minutes). 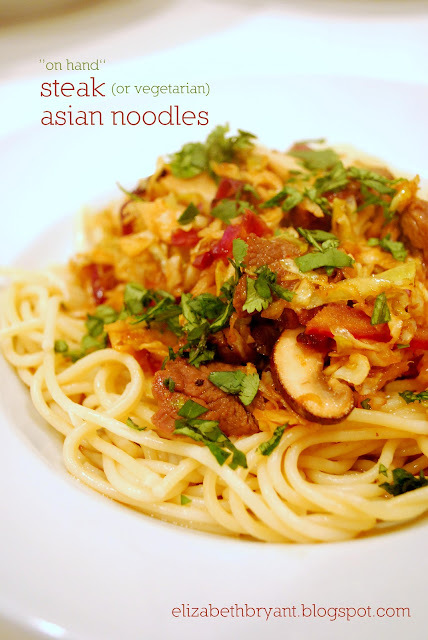 Serve over noodles and garnish with chopped cilantro. I found your blog and this recipe on pinterest. This recipe was a great one! My kids loved it and I thought that the sauce was very flavorful. Thanks for a great recipe. This recipe was delicious!! Even my picky four yr old chowed down on the noodles! I made a half of a recipe more of sauce and mixed my noddles in with the meat and sauce instead of putting it in top. I also used beef stew meat and tenderized in coke for the afternoon. very yummy and will be making it alot more! !